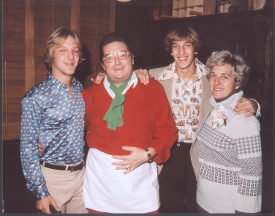 In 1971, Lou and Jean Malnati closed up shop at their first restaurant in Lincolnwood to host a one-night charity event to raise a scholarship fund for a local athlete that would play football at Wake Forest University in the name of famous Chicago Bear Brian Piccolo, who passed away from cancer. After Lou also fell victim to cancer in 1978, Jean and the Malnati family built on this one-night charity event by dedicating themselves to funding cancer research and treatment programs through the Lou Malnati Cancer Research Foundation. To date, the Lou Malnati Cancer Research Foundation has raised more than $4 million to benefit organizations who are dedicated to finding a cure for cancer, including the Lou and Jean Malnati Brain Tumor Institute. In November 2017, a transformational donation to the Northwestern Brain Tumor Institute by the Malnati family and the Lou Malnati Cancer Research Foundation led to the renaming of the Northwestern Brain Tumor Institute to the Northwestern Medicine Lou and Jean Malnati Brain Tumor Institute of the Robert H. Lurie Comprehensive Cancer Center of Northwestern University at Northwestern Memorial Hospital. This gift not only honors the heartfelt giving and tradition of generosity that Lou and Jean established, but brings to fruition their dream of seeing improvements and advancements in personalized care and support for patients suffering through cancer treatments. Additionally, this gift will attract and retain even more world class talent, who have the capability to create breakthroughs in battling brain tumors, and most crucially, help improve care and advance research for patients now and in the future. The Malnati Brain Tumor Institute is a nationally recognized leader in the fight against brain and spinal cord tumors, offering patients the most advanced clinical trials and treatment options available. Donations to the Lou Malnati Cancer Research Foundation can be made at any pizzeria, or online at lmcb.org. Would you like to get involved? Be a sponsor? Make a donation?